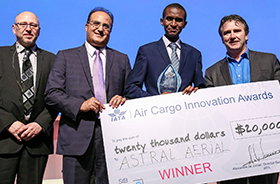 Geneva, Switzerland, 2017-Mar-22 — /Travel PR News/ — The International Air Transport Association (IATA) announced that Kenya based Astral Aerial Solutions is the recipient of the IATA Air Cargo Innovation Award for 2017, for the company’s Unmanned Aircraft System (UAS) Traffic Management (UTM) Concept for Africa. The award was presented at the 11th World Cargo Symposium (WCS) in Abu Dhabi. Astral Aerial’s project seeks to lay the foundation for safe, secure and effective UAS operations and integration into existing airspace to ultimately allow the expansion of air cargo in Africa. “The IATA Air Cargo Innovation Awards showcase the innovation going on across the air cargo industry. Among many worthy candidates I congratulate Astral Aerial Solutions for an outstanding achievement and hope the $20,000 first prize will help in its development. It is great to see a developing nation company helping to drive the innovation that is needed throughout the global air cargo industry,” said Glyn Hughes, IATA’s Global Head of Cargo. “We are delighted to be recognized for our innovative UTM Concept for Africa project. Drone technology has strong potential to boost the continent’s air connectivity and deliver goods and services to remote regions and more critical lifesaving products to those in need,” said Sanjeev Gadhia, CEO Astral Aviation. An independent jury which included industry experts, academics and CEOs of leading logistics companies evaluated 46 entries from across the industry from small start-ups to large multinationals. Projects were evaluated based upon the idea, its potential to create value, and the likelihood of achieving success. Five companies were shortlisted to present their projects to over 400 audience members during the WCS closing plenary, who subsequently cast their vote for their preferred innovation project. The IATA Innovation Awards were launched in 2014 to encourage and promote innovation in the air cargo industry. “As the world continues to evolve at an unprecedented pace it’s important to recognize the individuals and companies that are driving change. Innovation holds the key to industry development, sustainability and success and we are committed to help unlock its potential,” said Hughes. This entry was posted in Travel, Travel Awards, Travel Management, Travel Services, Travel Tech and tagged Astral Aerial Solutions, Glyn Hughes, IATA, IATA Air Cargo Innovation Award for 2017, Sanjeev Gadhia, Traffic Management, Unmanned Aircraft System. Bookmark the permalink.